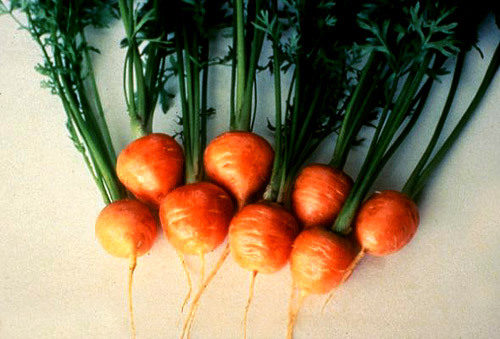 Careful attention to the soil makes these Vitamin A-rich roots a snap to grow. Plant in deep, stone-free soil (a raised bed is great) with a fine surface. Thin and weed carefully, and mulch to keep soil cool. Will tolerate very light shade. Good quality roots require plentiful moisture and soil that is deep, loose, free of stones, and high in organic matter. Roots can become twisted and forked in heavy, stony soil. Prefers pH of 6.0 to 6.8 but can tolerate 5.5 to 7.5. Requires only moderate nitrogen. Too much can cause root branching. Lifecycle: Biennial grown as an annual. Great crop for kids if planted in deep soil and site gets full sun. frost - Tolerates light frost. not native to North America - Mediterranean origin. First orange carrots probably developed in The Netherlands about 1600. Germination temperature: 50 F to 85 F - Will germinate at temperatures as low a 40 F. Will germinate in about a week at 75 F, with adequate moisture. Plant in spring, 2 to 3 weeks before last frost, � inch deep, � inch apart, in rows 12 to 24 inches apart. Deeply worked soil with fine, weed-free seedbed will greatly improve chances of successful crop. 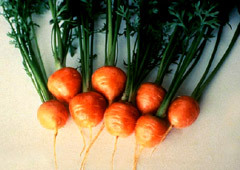 Carrots are slow to germinate (1 to 3 weeks), and often germinate unevenly over a period of several weeks. To speed germination, water lightly daily if soil is dry. Thinning is critical to reduce competition from neighboring plants. Thin to 1- to 4-inch spacings (depending on size of root desired) before plants are 2 inches tall. Cutting rather than pulling reduces disturbance of the remaining plants. To improve germination in dry weather: Make a small furrow, about 2 inches deep. Plant seed and cover with about � inch of soil. Cover furrow with a board to retain soil moisture until seeds germinate. Tip: Sow radishes in the same row. They germinate quickly, break the soil crust, and mark the row. Thin and/or harvest radishes before they compete with carrots. Use seed tape or pelleted seed for more even spacings and less thinning. Or mix seed in roughly equal proportions with sand, fine vermiculite, or dried coffee grounds. Mulch to keep soil cool, conserve moisture and to keep exposed "shoulders" from turning green and bitter. Another option is to hill soil over the shoulders. Make additional plantings every three weeks through midsummer for continuous supply and fall harvest. Sowing in very early spring is possible, but some varieties will bolt if temperatures are too cold. Plant crops for fall harvest about 10 to 12 weeks before first frost. Root quality is best when soil temperatures are 60 F to 70 F. The shape of the root is determined within the first few weeks after germination when the new plant extends its taproot deep into the soil. If it encounters obstacles (such as rocks or high water table) or is damaged, shape and quality of the root will suffer. To prevent diseases, don’t plant carrots in the same spot more than once every 3 years. Avoid planting on ground that was in sod the previous season. Use fabric covers to exclude insects. Carrot rust fly - Harvest all carrots by September 1 in upstate New York, by August 20 farther South, to avoid second brood injury. Carrot weevil - Clean up garden debris in autumn. Beneficial nematodes are available. Apply as directed on label. Leafhopper - Leafhoppers spread disease causing carrots to be woody, hairy and bitter. No cultural control is available. Browse carrot varieties at our Vegetable Varieties for Gardeners website. Imperator -- Up to 10 inches long, slender. Danvers -- Up to 7 inches long, slender, but wider at the top than the Imperator types and have strong flavor. Nantes -- Up to 7 inches long, more cylindrical than tapered, sweet flavor. Chantenay -- Up to 5 inches, wide at the top and tapering. Amsterdam -- Up to 3 inches long, thin and slender, good for early harvest and less-than-ideal soil conditions. Paris Market -- Round, short, about 1 � inches in diameter. Only grow longer varieties if your soil is deep, loose and stone- and clod-free. Choose short-season varieties for early planting and summer eating. Choose longer-season varieties for fall harvest and storage.